Punjab Information Technology Board has taken an initiative to provide respectable employment to the youth of the region by introducing an E-Rozgar program in Punjab province. The program is being run across 23 centers in the province. 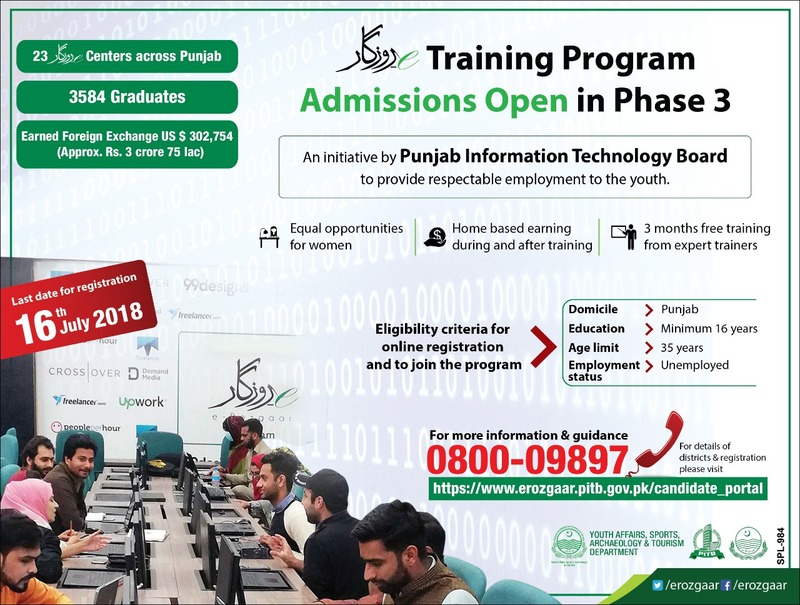 PITB has also collaborated with University of Engineering and Technology Lahore to run the trainings for the youth and to help them find a better and respectable employment according to the skills they achieve from this training program. So far 3584 students have been graduated. This training program is being offered to both women and men aged minimum 16 years (up to maximum 35 years), domiciled in Punjab and who are unemployed. The duration of the course is 3 months and the students will be trained under the guidance of the experts. The best feature of this program is the home based earning during and after the training. Next batch is going to begin soon, for which the registrations are going on. The last date to get registered in the course is 16 th July 2018. Hurry up and rush your entries to find a place for yourself. For complete details, contact at the number mentioned in the below advertisement. Apply for the training by clicking the button below.